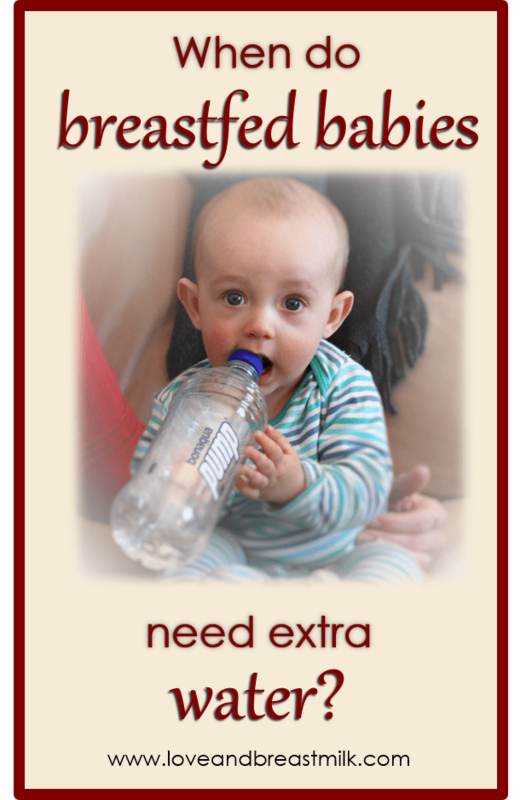 Love and Breast Milk > The basics of breastfeeding > Does my baby need extra water? It’s one of the most common questions asked by breastfeeding mothers: do I need to give my baby extra water? It may surprise you to know that the answer is almost always a resounding NO. In fact, giving water can be downright dangerous. Where do breastfed babies get water? If you had to guess, what would you say is the main ingredient in breastmilk? That’s right – water! Breast milk is about 88% water by weight. What does that mean in practical terms? For every 100ml of breast milk your baby drinks, he’s drinking about 90ml of water (the amounts in millilitres and grams are slightly different due to the density of the milk). So a baby who is breastfeeding often enough to satisfy his thirst and hunger will automatically be taking in enough water. The only time when your baby may need extra water is once he is eating solids. Is water just unnecessary, or is it harmful? Water dilutes the immune-strengthening, illness-fighting properties of breastmilk, so baby may be more prone to illness. Newborn babies who are given water instead of breastfeeding, or in-between breastfeeds, are more prone to developing jaundice. If baby is drinking water instead of breastfeeding, your breasts are not being stimulated – that could lead to a drop in your milk supply. If baby is replacing milk with water, he won’t get the protein, fats and other nutrients that he needs. This can lead to undernutrition – which can range in severity from poor weight gain to severe malnutrition. For young babies especially, water can actually kill. Drinking too much water can lead to a condition called hyponatremia. In this condition, the water dilutes the blood to such an extent that there is no longer enough sodium (salt) available for vital bodily functions. The brain and nerves are especially dependent on sodium to function properly; hyponatremia can lead to seizures, brain damage, coma and even death. The question of water is always raised in summer, when the heatwaves come. But we have a lot of research that shows that babies can get more than enough water just by breastfeeding. Some of the countries where they’ve done research on this include India, Jamaica, Pakistan and the Sinai desert – basically, some of the hottest places on the planet. If babies living in the desert or the tropics don’t need extra water, then I think we can safely say that they don’t need extra water anywhere on earth. It’s always an interesting experiment to express some breast milk when it’s hot – often, you will find your milk is more watery than usual. This is because your body knows that baby will need some extra fluids, and your milk is adjusting to meet that need. Baby will also ask to breastfeed more often, so that he can take in this extra water. Isn’t nature wonderful? As long as you keep breastfeeding on demand, your body will make sure that your baby’s needs are met. When do babies start needing extra water? 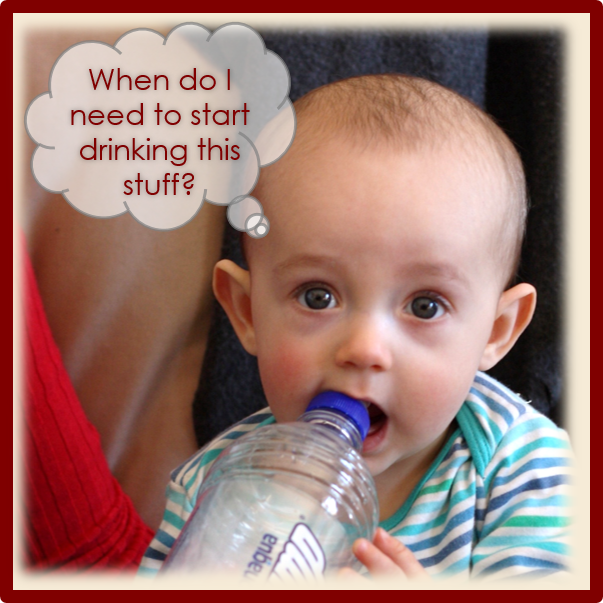 Obviously, babies don’t go their entire lives without drinking water, so when do you start? First off, you need never give water before baby is eating solid foods. As long as baby is only on breast milk, the nutrients and water are perfectly balanced to meet his needs. Once solids enter the picture, though, some babies start to need extra water, although others can still get enough water from breast milk for several months. When deciding whether to give water, as always, I believe in watching for signs that baby’s body needs it. Your baby’s nappies will tell you whether he needs water: if his urine is yellow (rather than pale) or if he gets constipated (with hard round balls of poop), it’s time to start giving water. In the beginning, babies don’t need much water; usually not even 50ml per day. You can offer water with baby’s meals and let her set the pace. Rooibos tea, fruit juice, cold drinks – babies don’t need any of these. These supposed “baby” rooibos teas are the worst – they’re just normal rooibos tea at twice the price! If you want to, you can give your (older!) baby unsweetened rooibos tea in the same way as you would give water. Sweetened rooibos tea, fruit juice (even 100% pure juice) and all other juices and cold drinks are not necessary and should be reserved for special occasions, just like sweets. They are pure sugar with no significant nutritional value. To get back to our original question: no, your baby doesn’t need water, unless he’s already eating solid foods and showing signs of needing extra water. For any baby under six months of age, giving extra water carries significant risks – to your baby’s health, to your milk supply and to your breastfeeding relationship. Nature has designed breast milk as a perfect system, so let’s not tinker with something that’s not broken!